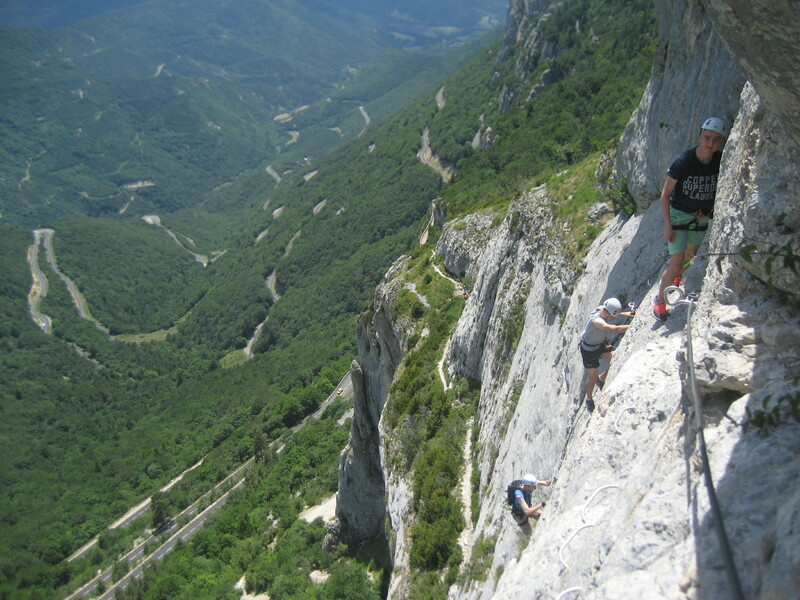 Cadets from Lord Wandsworth College CCF traveled to a small village called Autrans near Grenoble, France, to engage in a week of exciting Adventurous Training activities. 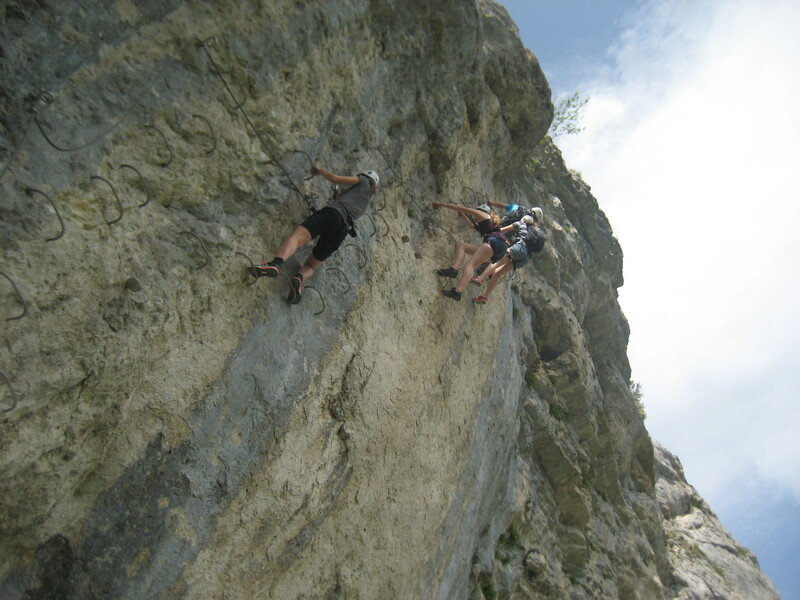 The idea behind the expedition was to take part in challenging activities in a setting that is bigger and better than anything the UK has to offer. 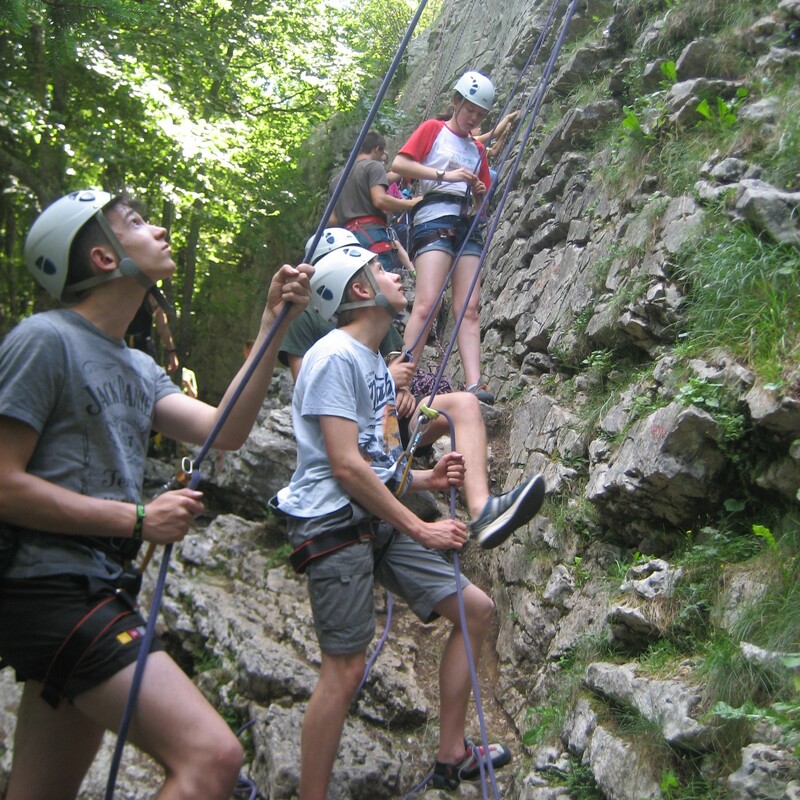 We were a small group of cadets ranging in age from 14 to 18, with a wide variety of Adventure Training experience within the group. Among the group were cadets who had joined the Unit less than a year ago and for them the novelty and scope of the challenge presented a steep learning curve. 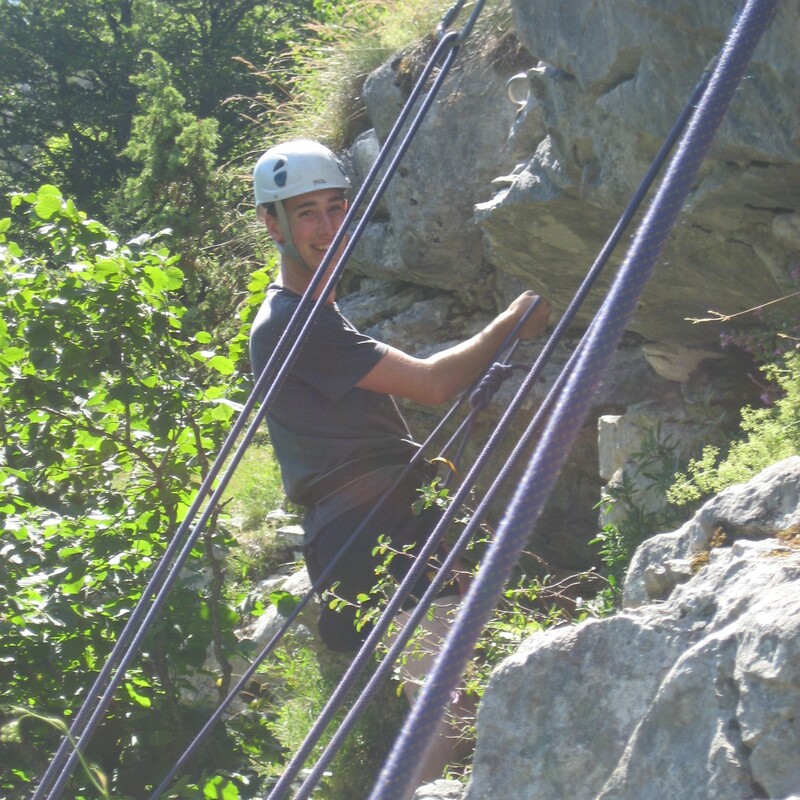 The activities engaged in were climbing and abseiling, climbing a near vertical 300 foot ‘Via Ferrata’, canyoning down a river gorge, going deep into an underground cave and mountain biking. 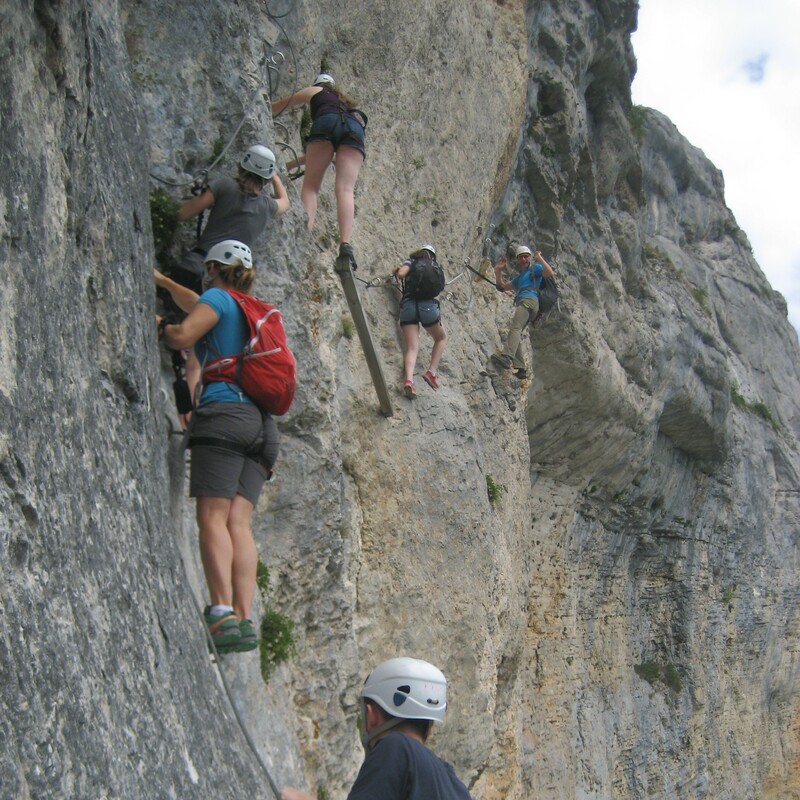 These activities were more extreme than anything any of the expedition participants had engaged in before. The idea behind them was to present participants with situations that they would find challenging, nerve-racking and fun. 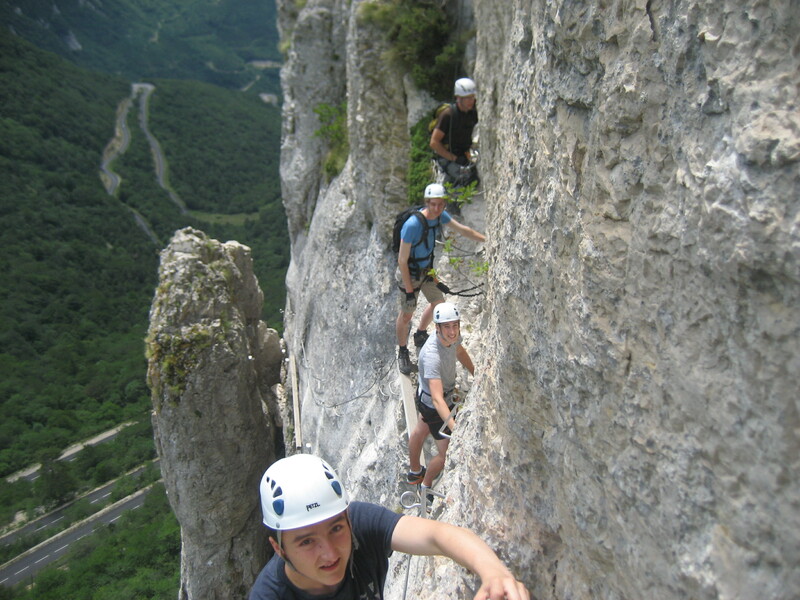 The Via Ferrata particularly challenged the cadets as they climbed vertically up the rock wall, looking down at the valley floor hundreds of feet directly below them. 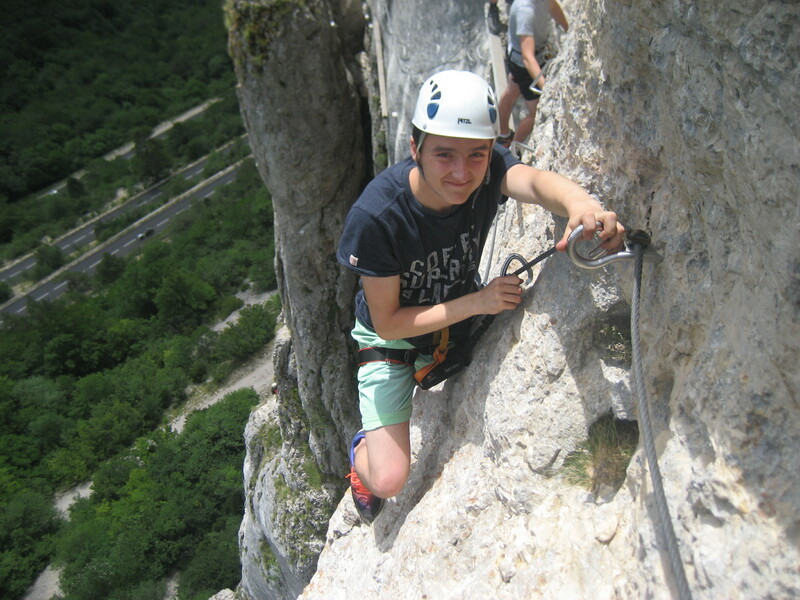 It was not even an easy climb as the metal rungs of the Via Ferrata were not placed at even intervals but often with large gaps between them and sometimes even on overhanging rock. 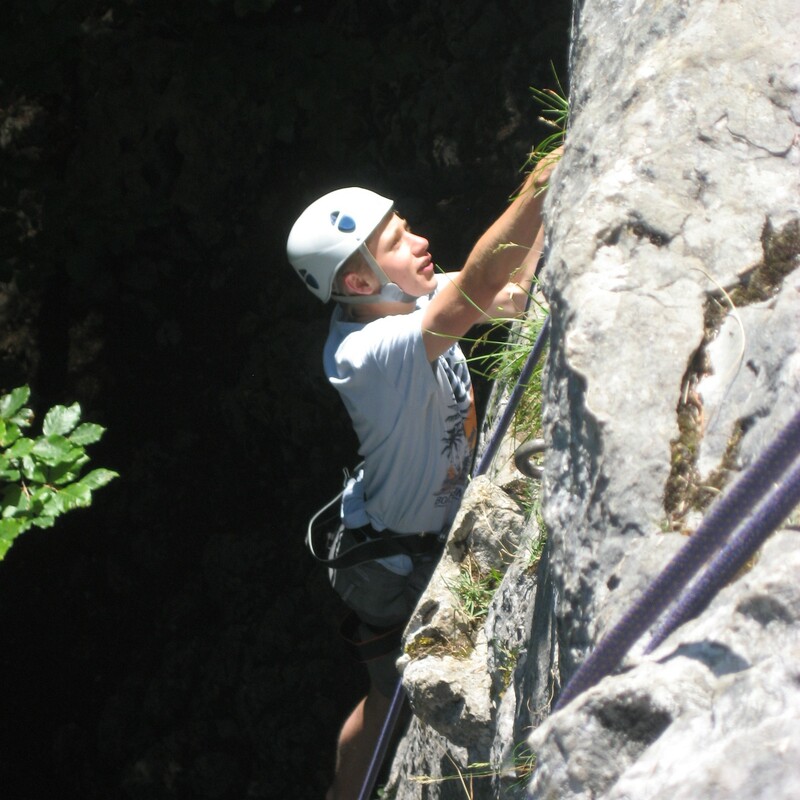 The cadets however were determined to get to the top and when they did eventually arrive, they were elated and relieved to have overcome their fears. 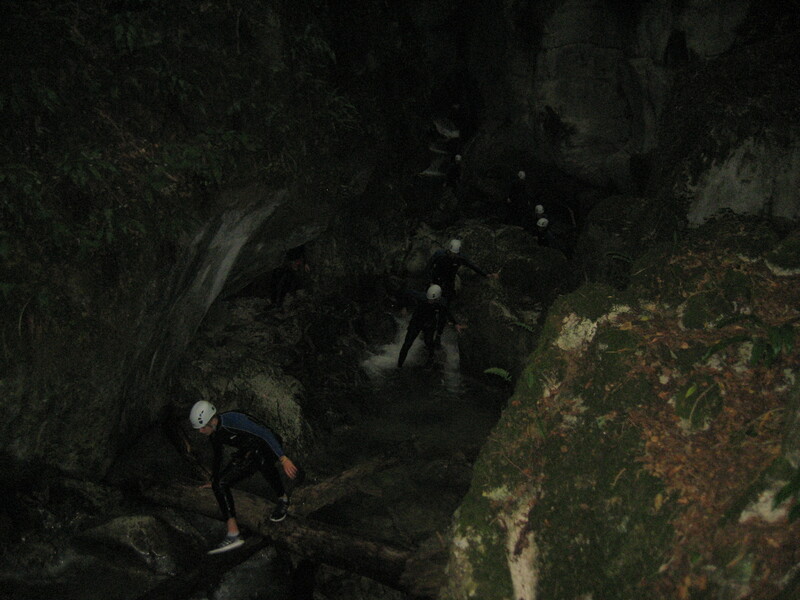 The canyoning was very popular as the cadets slid down natural water-slides and jumped 25 foot off rocks into deep pools. The cave was one of the biggest in the country but could only be accessed via a little boat on a lake and then a short climb up to a small gap in the rock to access the cave entrance. Self-reliance was also something that we worked on during the week as the cadets were camping and looking after their own kit and equipment. The other important skill required and developed was teamwork. 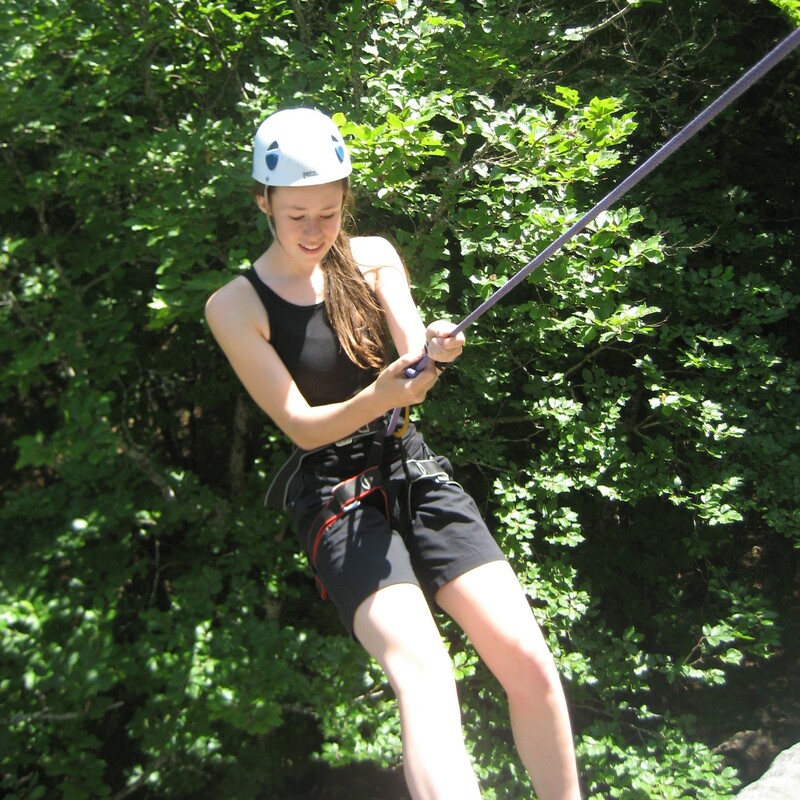 Many of the activities required the cadets to work together to achieve a successful outcome: for example, one climbs while the other belays; this meant the cadets learned to rely on each other and communicate effectively. The older Cadets, who are NCOs, became better leaders as they had to help, direct and inspire some of the junior cadets, even when they themselves were in testing situations. When the cadets were asked at the end of the expedition how they would rate the experience out of 10, every cadet answered 10. The participants will give a short presentation to the Unit when we return, and therefore the rest of the Contingent will gain some benefit from it from those who went. We were very fortunate to have gained a Grant from the Ulysses Trust which made it possible for the cadets to participate in the expedition as the cost would have prohibited some from going. 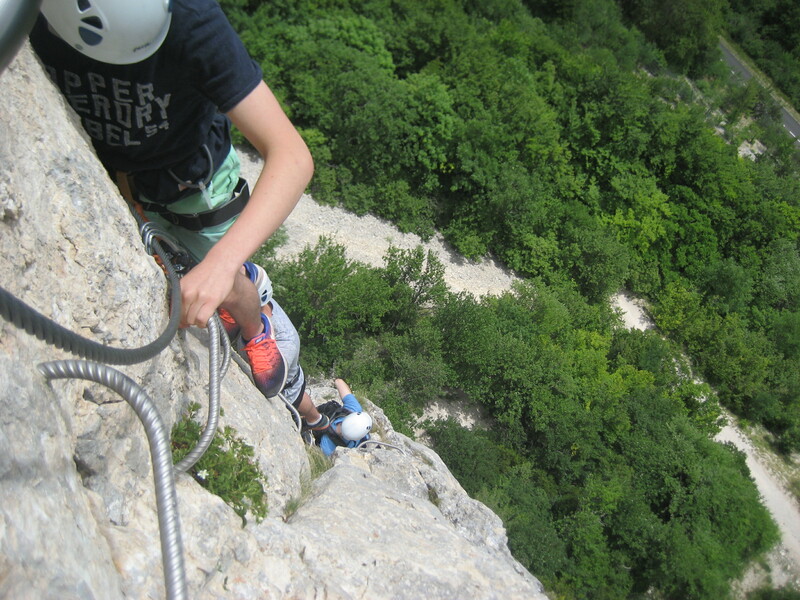 The aims of the expedition were not only met but exceeded and it was a very successful venture for all concerned.